Current: Glove boxes: Controlled atmosphere, HEPA filtered or both? Glove boxes: Controlled atmosphere, HEPA filtered or both? Controlled Atmosphere and HEPA filtered glove boxes have distinctly different design features which make their operation exclusive of one another; however, sometimes Controlled Atmosphere glove boxes require HEPA filtration. In order to control the internal gas chemistry (O², H²O, N², and CO² etc.) inside of a glove box, valves must be used with a compressed inert gas tank and a vacuum pump to remove the internal gas mixture and then refill with a pure, inert gas. This evacuation and refill operation works best when the glove box construction is very leak tight. Without a filtered, high air flow movement system, particulate control within these glove boxes would not be not possible. Alternatively, the HEPA Filtered Glove Box uses a blower pulling normal room air into the main chamber and then out again through inlet/outlet HEPA filters. 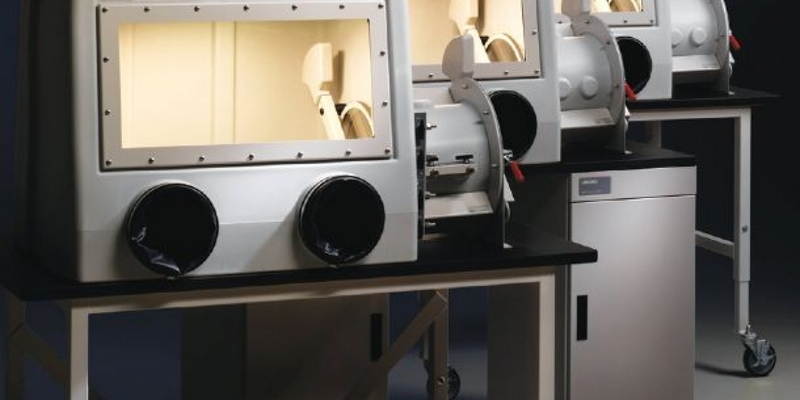 These glove boxes are primarily used for the containment of hazardous samples. The inlet HEPA air flow cleans-up particulates in the main chamber volume to an ISO 5 clean room condition. When a sample container of particulates is opened, the exhaust HEPA filter contains the loose particulates. When the sample container is closed, continued air dilution with the inlet HEPA filter air again cleans-up the internal glove box volume of particulates to an ISO 5 clean room level. Due to the filter openings and the air volume flushed through the glove box (0-70 cubic feet/minute (CFM)) the gas chemistry cannot be controlled. Oxygen and moisture concentrations will be at the same levels as the ambient laboratory atmosphere. But some glove box applications involve working with hazardous particulates in a low oxygen/moisture atmosphere. The answer to the problem is to control the particulates in the vacuum line of a Controlled Atmosphere Glove Box. A "Secondary Vacuum Line Trap, with HEPA filter," can be employed to contain the particulates that may be removed from the glove box atmosphere by the vacuum pump. This HEPA Filter Trap is spliced into the vacuum tubing that connects the glove box to the vacuum pump. This accessory prevents any hazardous particulates from getting into the vacuum pump and escaping through the vacuum pump exhaust tubing, which is normally vented to the outside. The particulate levels of the inert gas going into the glove box are generally not a concern. Vendors offering compressed inert gas tanks control particulate levels by product specifications provided to the glove box operator. If there is still a concern, there are a variety of micron filter plumbing fittings, which can be attached into the compressed gas tubing before it’s connected the glove box gas inlet valves. One last option: Labconco offers a Controlled Atmosphere/HEPA Filtered Combination Glove Box (pictured above). This system does not allow the two functions to operate at the same time. Two large isolation valves inside the glove box main chamber can be opened to a HEPA Filter and blower system creating a hazardous particulate control glove box. When the valves are closed, then operation is strictly controlled by electronic inert gas inlet and vacuum outlet valves. This sets up the combination glove box for controlled atmosphere operation.